Here is the book recounting the life and times of one of the most respected men in the world, Warren Buffett. The legendary Omaha investor has never written a memoir, but now he has allowed one writer, Alice Schroeder, unprecedented access to explore directly with him and with those closest to him his work, opinions, struggles, triumphs, follies, and wisdom. 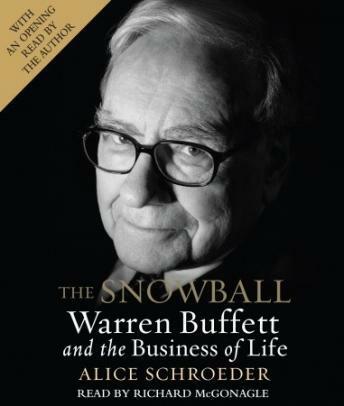 When Alice Schroeder met Warren Buffett she was an insurance industry analyst and a gifted writer known for her keen perception and business acumen. Her writings on finance impressed him, and as she came to know him she realized that while much had been written on the subject of his investing style, no one had moved beyond that to explore his larger philosophy, which is bound up in a complex personality and the details of his life. Out of this came his decision to cooperate with her on the book about himself that he would never write. Never before has Buffett spent countless hours responding to a writer’s questions, talking, giving complete access to his wife, children, friends, and business associates—opening his files, recalling his childhood. It was an act of courage, as The Snowball makes immensely clear. Being human, his own life, like most lives, has been a mix of strengths and frailties. Yet notable though his wealth may be, Buffett’s legacy will not be his ranking on the scorecard of wealth; it will be his principles and ideas that have enriched people’s lives. This book tells you why Warren Buffett is the most fascinating American success story of our time.